Spray texture is a common ceiling treatment for drywall ceilings. Textures hide surface flaws and diffuse light sources to create pleasing illumination. Various textures are possible, but one of the most common is the pebbly surface commonly called popcorn texture. A popcorn texture finish is usually applied immediately after wallboard installation, and it's one of the more cost-effective finishes available since it is applied with large sprayers that can cover a lot of areas very quickly. A major drawback, though, is that popcorn texture ceilings can be prone to damage or peeling. A roof leak or plumbing problem or even just high humidity may cause the texture material to loosen and fall away. When flaws appear, as they often do, one option is to rent the tools or hire a contractor to redo the entire surface. But a very suitable alternative solution is to purchase a can of spray-on texture, such as the type offered by Homax. 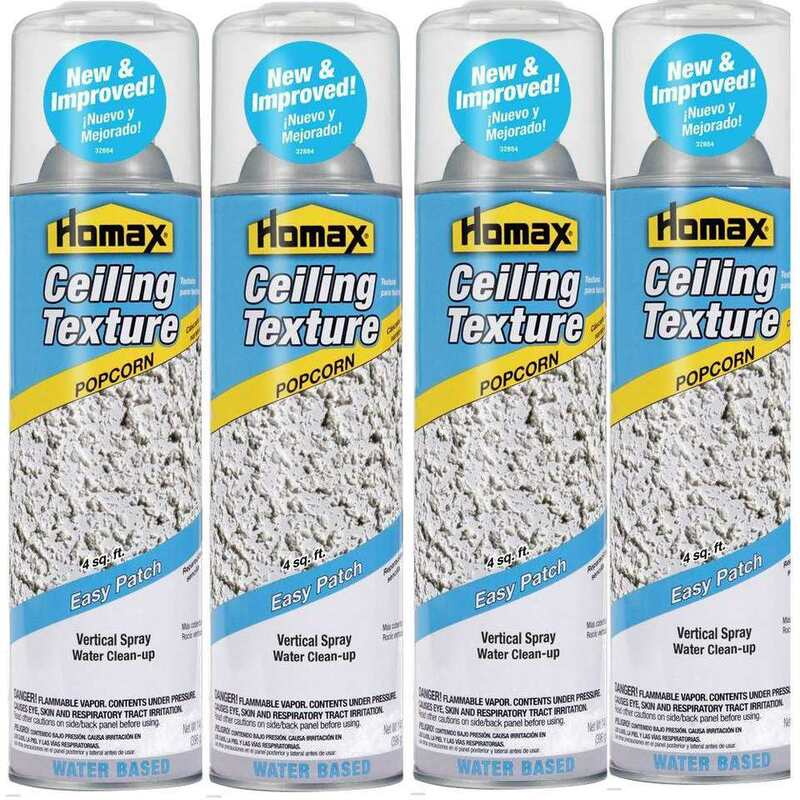 Homax Popcorn Ceiling Texture is an aerosol product that offers the fastest, easiest way to patch damage to popcorn ceiling textures. It is a water-based product, but it does contain flammable dimethyl ether as a propellant and thus should not be used near an open flame. Make sure the space is well ventilated when you apply it. The solids in the product include calcium carbonate, clay, perlite, and titanium dioxide. Make sure to wear eye protection when using this product. The spray will apply best at temperatures between 68 and 72 F. Make sure any loose texture is removed and that any underlying damage is repaired before applying new texture. If surfaces have mold or mildew due to water damage, the area should be cleaned and sealed with a mildew-inhibiting primer before proceeding. Make sure floor surfaces below the area are covered, as some textured material will fall. After shaking the can vigorously for at least 1 minute, insert the application straw. Holding the can vertically 10 to 14 inches from the ceiling, spray the ceiling using a back and forth motion. Do not over-apply; best results are achieved by applying several coats until the texture closely matches that of the surrounding ceiling. Allow the patched surface to dry for at least 24 hours before painting the entire ceiling. A complete coat of paint over the entire ceiling is usually necessary to successfully blend the patch area. In our use tests, we found that it takes some degree of practice to achieve the same texture as the original ceiling surface. Practicing your skills on a sheet of cardboard is well worth the time, but even with substantial practice, it's not likely you will achieve exactly the same texture as the surrounding surface. However, if the entire ceiling is painted after the patching is done, the results will be very good and not noticeable to most people. The aerosol can offers a very easy application. This water-based product is easy to clean up and less toxic than oil-based products. The product requires no troweling or smoothing after application. Multiple coats are often needed to produce the desired "chip" effect. A single can doesn't cover much area. Although product directions claim six square feet of coverage per can, we found this to be inaccurate. You may need to buy more than one can.